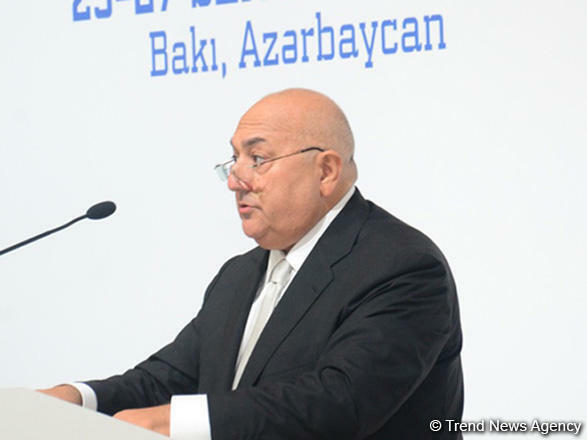 New types of defense products being produced by Azerbaijan have played an important role in the destruction of manpower and military equipment of the enemy, Trend reports referring to Azerbaijani Deputy Minister of Defense Industry Yahya Musayev. Musayev made the remarks at an event in Baku on Dec. 17 held on the occasion of the professional holiday of the employees of the Azerbaijani Ministry of Defense Industry. The deputy minister said that under the leadership of Azerbaijani President Ilham Aliyev, successive measures were taken to strengthen the material and technical base of the Azerbaijani Armed Forces. “As a result of the conducted work, the Azerbaijani Armed Forces were among 50 most powerful armies in the world,” he said. “The most important result of these battles was the liberation of Leletepe heights and thus, ensuring of the security of Jojug Marjanli village,” he said. “In May 2018, Gunnut village of the Sharur district of the Nakhchivan Autonomous Republic was liberated from the Armenian troops." Musayev also said that new types of Azerbaijani defense products played an important role in determining the location and destruction of manpower and military equipment of the enemy. He also spoke about the prospects facing the ministry. “The corresponding work is being carried out to determine new goals for the development of the defense industry and carry out specific work in this direction,” he said. Musayev added that one of the upcoming tasks is to increase the level of self-sufficiency to regulate the activity of industrial enterprises. “One of the important actions is also the expansion of production of civilian products using the existing production base,” he said.